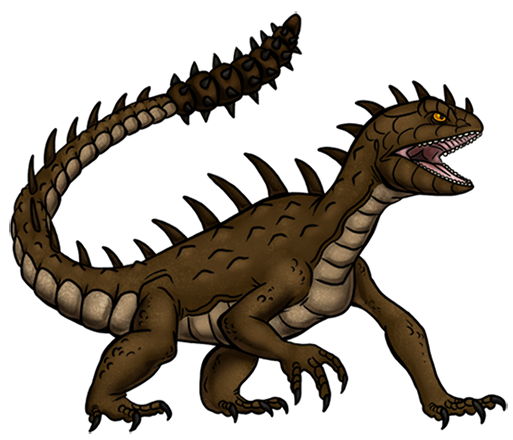 This heavily armoured Kreature is well protected by the osteoderms embedded in its skin and the row of quills sprouting from its back. It will excavate a burrow, making the corridors just narrow enough that it can touch the ceiling, the floor and the walls with its tail. This way, if it's pursued into its lair by an enemy, they can't avoid being struck by the spiny club on its tail. As a last resort, it will cave in the entire tunnel; its rugged hide and burrowing ability will allow it to escape, but the intruder will be buried alive. Hmmm…. This one sorta looks similar to Varan minus the gliding membranes.